Whether you are finishing a room or two in your new house or you are remodeling a home you have loved for years, deciding on the right flooring is going to be a big decision. At Gateway Design & Home Center in Loveland, Colorado, we offer hundreds of choices for your next project. We also have an expert team to help you find the perfect new flooring for you and your budget. To get you started, we have listed the top advantages of hardwood floors, one of the most popular choices on the market. Read on and call Gateway Design & Home today to schedule a one-on-one consultation! One of the most indisputable advantages of solid hardwood floors is their timeless beauty. Wood floors are a gorgeous addition to any home, and one of the most common things people look for when they are buying a house. It adds warmth to any room and the versatile, neutral colors of wood make it easy to match to other elements of design. Hardwood floors look incredible and it’s as simple as that. 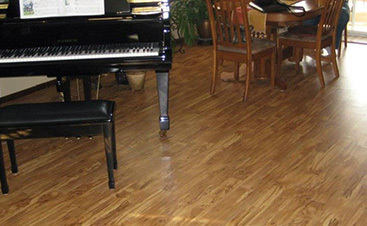 Another advantage of hardwood floors is their ability to withstand the test of time. They can last for years – hundreds of years, in fact – if properly maintained. When they become worn or lackluster, you can refinish your wood floors rather than replacing them entirely. Hardwood can also be sanded down to remove blemishes like scratches or ugly staining, and the thick planks can withstand several rounds of sanding before they lose their structural integrity. 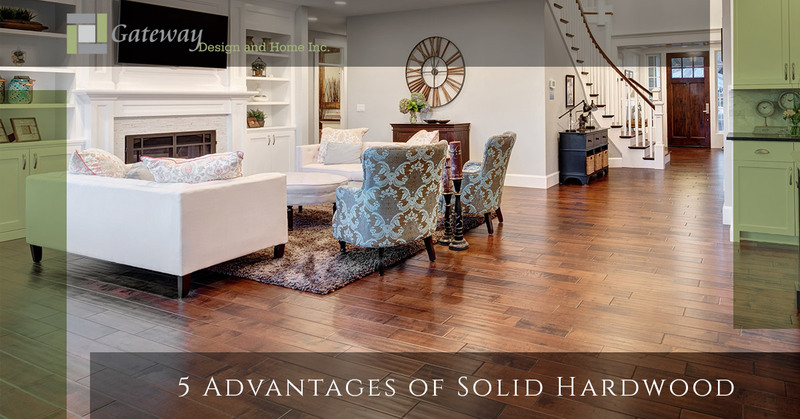 A common argument you’ll hear in favor of solid hardwood floors is that they add value to your home. There is no data to support the claim that you will be able to sell your house faster or at a higher price if you have wood floors, but there is a clear, confident opinion among realtors that this is the case. There is also solid evidence supporting the fact that homebuyers see hardwood floors as an asset, as we already mentioned. The beauty and long life of hardwood, which we touched upon earlier, are other unmistakable contributors to the value of solid wood floors. One of the greatest draws of hardwood floors is the wide range of choices in color, style, species, and more. Chances are that you will be able to find exactly what you are looking for, because wood is such a versatile material. 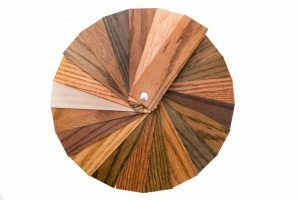 Choose from varieties like red oak, white oak, hickory, and more to customize the natural color and hardness of the wood, then find a stain to perfectly match the rest of your new room. You can even choose different types of installation for a unique twist — plain planks are not your only option by any means! 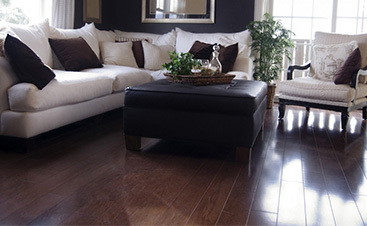 Finally, hardwood floors are great choice because they are easy to clean and maintain. All you need is a broom or a vacuum and the occasional treatment with wood cleaner. Hardwood won’t trap dust and irritants like carpet does, and stains that would ruin other types of flooring can often be wiped away. Refinishing is recommended to keep your wood floors in tip-top shape, but it’s a process you will likely only need to go through once every decade. Hardwood floors are a classically beautiful addition to any home. It is one of the most popular choices for new flooring not only because of its aesthetic draw, but also because of its long lifetime and straightforward maintenance. There are a few drawbacks, which you can read about in our next blog post, but there are hundreds of years of proof to the outstanding value of hardwood. For personalized advice on the best flooring for your home, call Gateway Design & Home Center or stop into our Loveland location for a one-on-one consultation today!